Wherefore Art Thou Rebecca Gates? Someone Recorded the Super Furry Webcast Yesterday, Right? This page contains a single entry published on February 23, 2009 9:42 AM. First The Fat Boys Break Up... was the previous entry in this blog. The Week in Tumblr is the next entry in this blog. Last Thursday I headed down to the 9:30 Club for what was just the second show I've seen all year (long story). 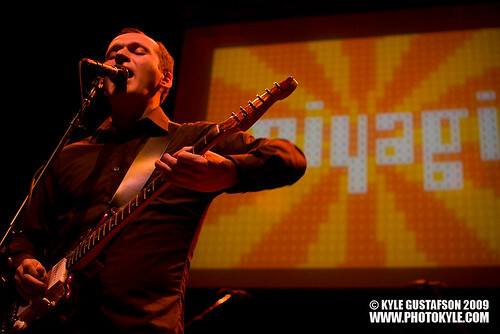 I had heard bits and bobs of Fujiya & Miyagi's work here and there and really liked their laid back, dancey vibe, so I thought they would be worth checking out. I was not wrong. Their minimalist dance pop may not necessarily jump out of the speakers at you on CD or MP3, but live, the band has a definite cheerful, festive vibe that carried over to the audience. A small but enthusiastic crowd danced the night away to songs like "Photocopier" and "Ankle Injuries." The projections behind the stage were pretty awesome as well. All in all, a pretty good show.